From time to time, everyone finds it difficult to concentrate. Tiredness, lack of interest, or distractions can make it hard to focus on the task at hand, regardless of effort. 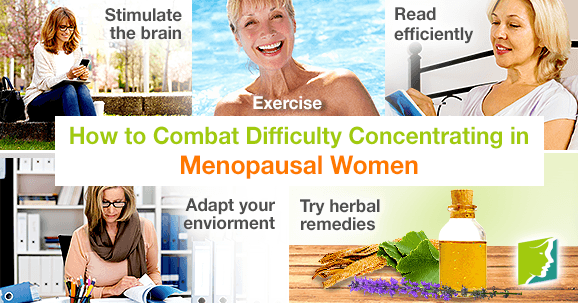 For menopausal women, difficulty concentrating may occur more than “from time to time”, however. The hormonal changes that take place during perimenopause affect the cognitive functions, which means short-term memory and attention span may suffer. These are vital functions, both in the workplace and socially, so it's important to combat cognitive issues. Use the following steps to improve concentration during perimenopause. The cognitive functions that control concentration are strengthened with regular use. Think of concentration as a muscle; the more you use it, the stronger it will become. Stimulate your mind regularly by devoting time to activities that involve prolonged thought and engagement. Consider learning a new skill, like a musical instrument or foreign language, or playing board games, solving puzzles (e.g., crosswords and sudoku puzzles), or a doing brain-training app on your mobile device could also work. Studies have shown that participating in regular aerobic exercise - like swimming, jogging, or dancing - for 30 minutes, five days a week, has a considerable strengthening effect on short-term memory and attention span. Whatever exercise you like to do that gets you moving can help. Regular and prolonged reading is not only a necessity in many professions, but it is also an effective way of combating difficulty concentrating, as it engages your cognitive functions. Problematically, prolonged reading can be tiresome if you suffer with concentration issues, so learning to read efficiently could be a vital skill. Begin by skim reading a piece, taking in the titles, subtitles, and bold text to give you an overview, help you avoid the unnecessary parts, and focus in on the important information. Read on the relevant passages with a pen in hand so you can underline main ideas without interrupting the flow of your reading. Bear in mind that each paragraph will usually contain one key idea, which can usually be found in either the opening or final sentence. If you've understood the idea in each paragraph, you've most likely understood the gist of the piece. Adapt your environment so it's conducive to concentration when it needs to be. For example, if you work in an office, clear your working space of distractions, sit upright and comfortably, ensure the room is ventilated, and stay hydrated. Every 20 minutes, take a five-minute break, but be disciplined about the length of your break to avoid compromising productivity. Using specific medicinal herbs, either as teas or in supplementary form, could also help maximize your mind's engagement. Ginkgo improves blood circulation to the brain and boosts cognitive activity, especially during aging. Ginseng improves mental sharpness, and Spanish sage essential oil stimulates the part of the brain that enables the willful recalling of information. While you work on the suggested steps, it's important to try not to get frustrated. Time given to exasperation is not only unhelpful; it's also just another distraction to occupy your mind. Be patient with yourself and don't expect results overnight. Keeping your brain stimulated is the best way to strengthen your cognitive functions; finding engaging ways to do this every day will sharpen your mind over time. Read about lifestyle changes to improve concentration.